Every MMO has stories to tell, some written by developers and told through quest content and others created by players through everyday gameplay. Themepark MMOs lead every player through the same fictional story and give no real control over the outcome, but I have to wonder whether the effort invested in that story is even worth it. MMOs are meant to have long-term replayability, and a linear story is new only the first time you play through it. After a while, players find themselves skipping dialogue, ignoring quest text, and grinding yet another character to the endgame. In contrast, sandbox MMOs tend to eschew their own storylines in favour of letting players make it up as they go along. Sandbox MMO EVE Online has spawned some incredible tales and videos over its lifetime, with stories of political goings-on, wars, and record heists hitting the news every year without fail. EVE stories usually also appeal to many people who don't even play the game, an effect uncommon in other MMOs. It's not often that the in-game exploits of a themepark MMO guild will reach the media or generate the same level of interest as a big EVE story, so what is the magic sauce that makes stories from EVE so appealing? In this week's EVE Evolved, I look at some of the best stories and videos from EVE Online and ask why EVE continues to grip us with its stories and themepark MMOs don't. In April 2005, one of the most iconic EVE stories ever told hit the pages of PC Gamer magazine, telling the world a tale of corporate infiltration, revenge, and theft that sounded like something out of a movie. The Guiding Hand Social Club mercenary outfit accepted a contract on the life of Ubiqua Seraph CEO Mirial and got more than it bargained for. Over the course of several months, Guiding Hand spies infiltrated Ubiqua Seraph and worked their way up the ladder to become Mirial's closest companions. They proceeded to bring the corporation to its knees in one fell swoop, destroying Mirial's most prized ship and raiding the corporate hangars for untold billions of ISK in valuable blueprints. It's incredible heists like this that grip us most about EVE Online, and they didn't end with the Guiding Hand's famous 2005 haul. In 2009, the leader of EVE's biggest player-run bank jumped ship with several hundred billion ISK, which he reportedly sold for cash to pay for medical bills and a deposit on a house. In 2010, the world collectively facepalmed as a player was destroyed with over $1,000 US worth of game time codes in his cargo hold, and just a month later player Bad Bobby closed up his Titans4U investment scam to the tune of $45,000 US. That record remained unbroken until August 2011 when Phaser Inc stole over a trillion ISK, worth over $50,000 US, in a classic ponzi scheme grown to epic proportions. The same sandbox ruleset that allows people to invent themselves as villains and thieves also lets people become heroes, business gurus, and even developers. Positive stories tend not to gain the same traction in the media, but they're still an inspiration to players who want to make a name for themselves. The members of Rooks and Kings corporation are definitely heroes to some people in EVE thanks to their incredible videos showing PvP at its finest. While every game inspires fan-videos, EVE's great films like Kale Ryoko's Future Proof and the Clear Skies series put the rest of the world to shame. The curators of EVE University, the owner of gambling industry SOMER.Blink, and the alliance leaders who built themselves up from nothing are all heroes to one player or another; they're positive examples to live up to. The stories of their successes provide genuine inspiration and drive to other players and are responsible for a lot of players signing up to see what all the fuss is about. An MMO zone or dungeon could have a fantastic story, but it doesn't matter as players will eventually get sick of it and skip it. Star Wars: The Old Republic is a perfect example of this in action, with a fully voiced core storyline for each of its classes and every quest NPC. 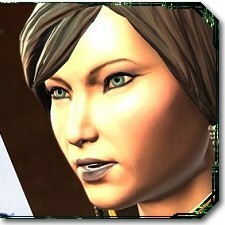 Massively's resident SWTOR expert Larry Everett highlighted the problem in a recent Soapbox article. "Six months after launch," he explained, "the majority of players will threaten to leave a SWTOR pick-up group if the other players don't skip over the dialogue." This encourages people to either ignore the story or play alone, neither of which is ideal for an MMO. Quest chains and levels have a similar effect, rendering it very unlikely that you'll come across someone at the same point in the story as you unless you started out playing together. If you want to play with someone else, one of you will have to wait for the other to catch up, and at that point you're being punished for playing with someone else. It's almost as if the game mechanics of themepark MMOs are designed to split people up rather than bring them together, and I think that severely hampers the creation of player-driven events. If you put hundreds of people together in one place, you can be guaranteed that something interesting will spontaneously happen. When we hear about events in an MMO, they're usually seasonal festivals or expansion launch events organised by developers. Sometimes you'll hear about a World of Warcraft guild getting the world first kill on the final boss of a raid or a roleplaying event happening. Somehow those stories don't feel as important or real as a huge virtual theft in EVE, and even if you play the game in question, you're unlikely to be a part of that story. In a single-shard sandbox like EVE, a huge battle, heist, or other event could impact every person who plays the game. A war in the drone regions could affect mineral prices, and territorial wars can cause corporations to fracture or move into piracy. Even when developers make the story, EVE's sandbox universe always seems to put the outcome in the players' hands and make the event feel more real as a result. 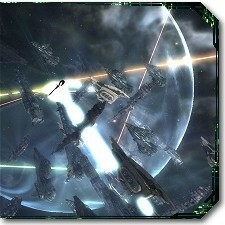 In June 2010, EVE players banded together to repel Sansha invasions across high-security space. Though the event itself was organised and run by CCP Games, players practically took the story out of CCP's hands and ran with it. Groups sided with the Sansha menace and were given inside intelligence for becoming part of the slave army. 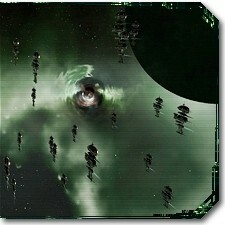 Others worked frantically to locate the Sansha home base system within a hidden wormhole system and set up early warning networks for invasions. That's a much better story than a guild killing a boss! Themepark MMOs tend to take the player by the hand and lead him across the landscape to see fictional stories played out by endless streams of NPCs. While this may make for a great first-time game experience, it encourages players to enjoy the game on their own, and an unchanging story has little long-term appeal. The stories in a themepark MMO are just window dressing on a grind to endgame, but in a sandbox, the stories are tales of real emergent gameplay. I think the main reason EVE makes such real stories is the sandbox nature of the game and the complete lack of rules governing in-game interactions. As everything happens on one server, you can't just move somewhere else to escape retribution or competition for resources. Perhaps the intrigue, deceit, and political chaos we see in EVE will spontaneously emerge in any MMO if enough players are put together in one place and forced to compete. 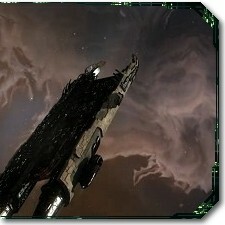 Brendan "Nyphur" Drain is an early veteran of EVE Online and writer of the weekly EVE Evolved column here at Massively. The column covers anything and everything relating to EVE Online, from in-depth guides to speculative opinion pieces. If you have an idea for a column or guide, or you just want to message him, send an email to brendan@massively.com.